Gympik.com is set to organise the scattered fitness industry by offering easily accessible fitness services, even at the comfort of home. WI Bureau brings you an exclusive report. Initiated to establish one of the biggest marketplaces for fitness, Bangaluru-based Amaresh and Ajay has established Gympik in December 2012, a potent start-up in the present ecosystem to offering exclusive at-home fitness training and adequate info about near-by fitness centers in the town, with detailed info about the various workout options and fitness trainings offered in them and much more. Being a fitness enthusiast himself, Ojha, has tried various gyms and fitness centers himself for over 7 years. During which he met multiple gym members who were keen to get personal fitness training from the certified instructors at the comfort and hygiene of home. While, some used to face issues pertaining to commuting to a distant fitness center. Thus, to bring this ever existing yet growing gap in the fitness industry, Ojha has decided to offer and easily accessible way to reach the right person at the right time with a click of button. “I thought of creating a platform where one can easily log in and find a trainer or center- which is Gympik. It’s like Zomato where you can select the category of workout, trainer, location etc, and you’ll get the easiest available options. The website offers every single detail related with the gym, fitness center, trainer’s profile and experience, the kind of facilities do they have etc,. We also use reviews of people where people talk about new centers like how do they like it and more. The info we provide on Gympik is as good as walking to a fitness center,” shared Ojha. So far, the start-up is operating in three metros successfully which includes Mumbai, Delhi NCR and Bangaluru. It is operating via contract employees, usually interns, who collect required data for them, backed by accurate background screening. “The data base has been formed with the help of three basic steps. The first step, we check the basic contact info, about the one who desire to enroll. The second step is to take all the other data like how many trainers a fitness center have, what’s the floor area, do you have a changing room? Do you have AC, parking area and everything? In the third step, photographer walks into the gym, takes all the images, creates a 360 degree view and uploads it. Further, we are very soon launching in other cities like Hyderabad, Chennai, Ahmedabad, Jaipur, Surat, Baroda, Chandigarh and couple of other cities,” shared Ojha. Nevertheless, Gympik has a mobile app for android users via which they can easily locate the required info of fitness centers, trainers, charges, equipments offered in the gym and so on. The Gympik has three revenue models, which includes cloud-based software on the lines of Practo Ray. Practo has software to manage the OPD for the doctors. 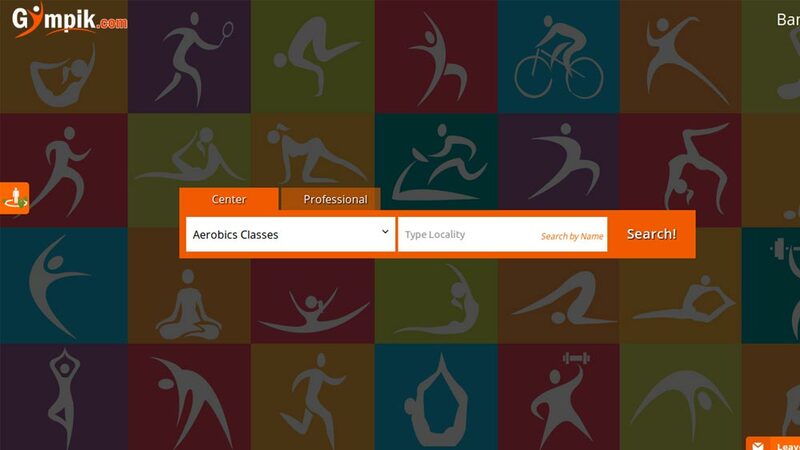 It’s on the same lines where we are going to give them (fitness centers) a software to the centers to manage all the user analytics and optimize services for the users. “The second one is helping with the personal trainers as lot of people, especially in Bangaluru, residing in apartments have very fancy gym equipped with high-tech equipments and machines, the only thing they don’t have is a trainer. So, we want to help all these people with qualifies, certified trainers. We have a network of close to 4000 trainers with us right now in India, who have signed up for this model. Also, we have a very sophisticated software to optimize the workforce. I mean, which trainer will go to which locality. These are all automated and we use a specific tool for that,” said Ojha. Likewise, the third one is a low calorie food help people count their daily calorie count. “If somebody is taking personal training through us, they ask for food and calories intake, sometimes about nutrition required for their body and food diet. So, we’ll also have a fat counseling available online via which, we can connect the member to the dieticians and can share their diet plan. In fact, this model could be used via the mobile app to generate alerts to fix a reminder to eat food, fruits and other essentials,” noted He. Since, all the brilliant ideas are backed by some challenges, the fitness industry has its own drawbacks and leading the list is – unorganised sector. Even though, too much movement is foreseen in the industry with growing rage of fitness backed by changing lifestyle and rising income level, still the sector is unorganised. Thus, Gympik has initiated a step to bring all the players – small or big- under one roof and connecting them to their end users- the potent consumers via technology. Significantly, Gympik doesn’t limit them to bridge the gap between consumers and service providers. It has a long-term goal to chase, which also includes nutritionists, therapists and other related professionals to bring under the same umbrella. “We want to create Gympik as one stop solution for all the fitness need. Not only in terms of finding the products related to fitness, but also, all the services which are there. Suppose you need a dietician, nutritionist or a physiotherapist, we want to create a platform where it becomes very easy to discover fitness, track fitness and we want to use technology at the core, where, we could put into all these data analytics machine learning, what all the big companies are using now, to make it a very seamless place to use by all. In simple language if we say, we want to have a complete ownership of the customer,” unveiled the Founder. Moreover, the start-up has elaborate plans to low-calorie food where a lot of people would come to our platform and find out how much calorie they must consume. That’s another revenue model we have planned and we are working on that. About Us: Hottest opportunity to join hands with Matka Khichdi- India’s..
About Us: The Louis Unisex Salon is an exclusive Global Circle.. Importance Of Building A Network In Franchise..
Is ICT-Based Learning The Next Big Thing?.. Low Investment Wellness Business Ideas..
Higher education in India- Vision 2030..
6 Reasons Why Staff Training Is Important..
Wella new face: Whitney Port.. Content Marketing Tips for Healthcare Brands..
Use Of Social Media In Franchising..
How Digital Education is Taking Over India..